Donald Trump’s ascension to the Oval Office has not buffeted US-India ties to the same extent as it has American relations with other key powers. In part, this is because Trump was elected on a wave of sentiments not dissimilar to those that powered Prime Minister Narendra Modi’s victory in India’s 2014 elections: an anti-establishment impulse among voters who wanted decisive political change, the discrediting of a metropolitan political elite, new forms of mobilization made possible by social media, and nationalist populism. More broadly, however, for nearly two decades US-India ties have grown cumulatively deeper despite repeated changes of government on both sides, leading to some assurance in Washington and New Delhi that a relationship that started from a low base but developed rapidly is institutionalized enough to withstand personality changes at the leadership level in both countries. US-India ties since the late 1990s have been driven as much by compulsions such as China’s rise and defeating terrorism as by intrinsic factors. Those external drivers have only grown stronger over time, driving relations between Washington and New Delhi to new heights under a diversity of leaders that includes Atul Bihari Vajpayee, Manmohan Singh, and Modi on the Indian side and George W. Bush, Barack Obama, and Trump in the United States. Nonetheless, anxiety over Trump’s policies as well as the uncertainties cast by Asia’s rapidly shifting strategic landscape mean that US-India relations are entering a new phase. They are likely to continue to consolidate but with some bumps along the way. While the United States clearly needs to get its domestic house in order and infuse its foreign policy with greater predictability, India also has work to do to punch at its strategic weight at a time when China’s expanding influence threatens to reduce its strategic space not only in continental Asia but in the Indian Ocean region. Eyeing on developments since the new US administration took power, this article outlines the scope for US-India cooperation on key geopolitical and economic issues while exploring divergences in approaches that need to be managed by the two powers on issues including Afghanistan and Pakistan, China, and East Asian security more broadly. Delhi and Washington were on opposite sides during the Cold War, with India’s policy of non-alignment eliding after 1971 into a diplomatic-military alliance with the Soviet Union. After the Cold War ended, the United States and India spent the 1990s fighting over India’s nuclear program, culminating in India’s nuclear-weapons test in 1998 and the imposition of additional American sanctions against it thereafter, on top of those Washington already had levied to deter India from its nuclear breakout. However, that nadir in relations produced a strategic opening as the two countries engaged in a dialogue that revealed common strategic concerns about China’s rise, the danger of radical Islamist terrorism, and other issues. American officials also came to see that India had tested for defensive reasons and was not a weapons proliferator, but in fact took an extremely restrained approach to nuclear deterrence. Vajpayee issued an appeal that the two countries were in fact “natural allies,” and a breakthrough visit to India by Bill Clinton in 2000 set a new tone for the relationship. Bush came to office interested in building a new form of partnership between the world’s biggest democracies, including India, leading to a lifting of American sanctions, a formal declaration of strategic partnership, a 10-year defense agreement, and the Indo-US civil nuclear cooperation agreement, in which the United States led a diplomatic campaign to recognize India as a responsible nuclear state that could access the international trade in civilian nuclear technologies. Obama built on this foundation, calling for India’s permanent membership in the United Nations Security Council, forging a Defense Technology and Trade Initiative to expedite high-end military cooperation, expanding bilateral initiatives in education, agriculture, and other sectors, and issuing a joint Indo-US vision document for East Asia that outlined common goals of maintaining a balance of power across the Indo-Pacific region. Successive transitions of Indian prime ministers, from the Bharatiya Janata Party (BJP)’s Vajpayee to the Congress Party’s Singh in 2004 and then to the BJP’s Modi in 2014, did not stand in the way of steady progress in bilateral cooperation. Indian officials and politicians were more sanguine about Trump’s victory in the 2016 elections than those of many other American partners. In part, this was a function of the fact that US-India relations had scaled new heights despite repeated changes of administration in both countries. The more nationalist-populist bent of the Modi government also meant that the Indian political class saw less that was novel in Trump’s ascendancy than did more liberal governments in allied nations in Europe and elsewhere. His tough talk on China and terrorism during the campaign gave hope to Indian leaders that his administration would take a robust line on two of India’s greatest strategic concerns, while his preference for bilateralism over multilateralism, exemplified by US withdrawal from the Trans-Pacific Partnership (TPP) in which India had not been included, accorded with India’s similar approach to its relations with key global powers. In short, Indian officials’ worries about a flagging US commitment to Afghanistan may be offset by their correct anticipation of a harder line against Islamabad under the Trump administration. Indeed, while a US pullback from Afghanistan would heighten strategic instability, a modest remaining US troop presence would diminish the leverage Pakistan has held by virtue of controlling the overland supply lines into Afghanistan that provision Western forces. The catch is that the additional vacuum of power resulting from a US policy of retrenchment would draw Pakistani assets further into the Afghan vortex, leading to a potentially symmetrical response by India on behalf of its own clients there. So even a deterioration in US-Pakistan relations would not necessarily redound to India’s advantage, as it could further heighten conflict between the two South Asian countries over their respective spheres of influence in Afghanistan. And despite rising tensions in Washington’s relations with Islamabad, Pakistani leaders are emboldened by the strong economic, military, and diplomatic support they are receiving from China, which has pledged more than $60 billion to construct the China-Pakistan Economic Corridor and consequently has a higher stake in Pakistan’s internal politics and security. China’s growing footprint in Pakistan poses a profound strategic challenge to Indian preponderance in South Asia. Two particular issues stand out for India’s strategic community. The first is Xi’s Belt and Road Initiative (BRI), a scheme to connect Eurasia and the Indian Ocean in a web of maritime and overland transport and energy corridors that, if realized, would create an economic hub-and-spokes system with China at the center and wielding disproportionate political influence in many of the countries benefiting from Chinese-built infrastructure projects. South Asian countries including Pakistan, Sri Lanka, Bangladesh, Nepal, and Myanmar had already been the primary destination for Chinese arms exports, disconcerting India; now they are also key targets for massive Chinese strategic investments such as Hambantota port in Sri Lanka and the China-Pakistan Economic Corridor (CPEC), a scheme to provide over $60 billion in transport and energy infrastructure linking western China to the Arabian Sea via the port of Gwadar. For India, CPEC is a triple blow. First, just at the time when US assistance to Pakistan is increasingly being conditioned on an end to that country’s support for terrorism, China stepped in to fill the vacuum in ways that more than offset cuts in US assistance to Pakistan as proposed by the US Congress. Second, China’s support empowers Pakistan in its long-running conflict with India, strengthening its economic and strategic relationship with its Chinese patron in ways that insulate Islamabad from pressure to pursue a more peaceful relationship with its South Asian rival. Third and most compellingly, CPEC includes Chinese-sponsored roadworks across disputed territory in Kashmir, which—despite Indian claims as its own—is occupied by Pakistan, directly infringing on Indian sovereignty and making the festering territorial dispute even harder to resolve. Any hot India-China conflict would be an unprecedented test of the US-India strategic partnership. New Delhi and Washington do not have a formal alliance, so there is no security commitment by the United States to India’s defense. But just as Prime Minister Jawaharlal Nehru called President John F. Kennedy in panic to request military support as Chinese troops rushed over the Indian border in the 1962 war, so too would Modi reach out to Trump in the event of limited Indo-China war in Doklam or other parts of their disputed border. It would be a hard test for US-India relations and for New Delhi’s vaunted policy of “strategic autonomy,” which has precluded a more formal alliance-type association between the two powers. Since taking office in 2014, Modi announced a transformation from India’s rhetorical “Look East” policy focused on economic engagement with Southeast and East Asia into its more robust “Act East” form, which includes strategic cooperation as well as renewed emphasis on deepening trade and investment ties. Some of the most promising implications of Act East for American interests relate to how they dovetail with key US strategic priorities. India is building a quasi-alliance relationship with Japan, the core American ally in East Asia. Its deepening strategic and economic linkages to India reinforce the US interest in Japan coming out of its alliance cocoon to play a more active role as a regional and global security provider. India’s most developed military relationship in Southeast Asia is with Vietnam, with which, as one of the most China-skeptic states in Asia, the United States is also expanding security ties. India’s ties to Vietnam and other Southeast Asian powers give it a particular interest in the continued right of free passage in the South China Sea, through which more than half of India’s seaborne trade moves. A stepped-up Indian role in the South China Sea, up to and including the prospect of joint patrols and exercises with the US Navy (as India has already conducted in the Indian Ocean and Western Pacific, and as the commander of the US Pacific Command has called for), would reinforce American interests in resisting China’s sovereignty claims there. India’s increasingly competitive relationship with Beijing means New Delhi is likely to be more sympathetic to American efforts to limit China’s ability to assert hegemony over its region, and that there is much Washington and New Delhi can do together to prevent China from controlling the maritime balance of power, including in the eastern Indian Ocean. Act East is very much about situating India more centrally as a pan-Asian power in ways distinct from its role on the subcontinent. But it can also be understood as a vehicle for closer strategic cooperation between India and the dominant Pacific power, the United States. Just as the parallels between BRI and Act East are compelling—China is moving west as India is pushing out to its east—so too are those between the more robust approach India has developed toward its East Asia policy over the past five years and the US rebalance to Asia over the same period. From 2014, right around the time Modi took office and declared that India was moving from Looking East to Acting East, the US Defense Department clarified that it saw a central role for India in the US rebalance. Correspondingly, Secretary of Defense Ashton Carter focused more of his personal energies on enhancing defense ties with India than perhaps any other Asian bilateral defense relationship. The US pivot and Indian Act East are conjoined in a number of ways, including the US-Japan-India trilateral forum that has brought their assistant ministers together for strategic discussions, and Japan’s participation in the US-India Malabar naval exercises. The rebalance of both New Delhi and Washington to deeper collaboration in East and Southeast Asia was also formalized by the Joint Vision document on East Asian security, to which they agreed in 2015, laying out an expansive arena for cooperation on common interests and in defense of shared principles in the wide region encompassing the Asia-Pacific theater. The United States has an interest in an Act East policy that is independently generated and pursued by New Delhi, rather than being an extension of the US-India partnership. This is particularly true in light of uncertainty over the Trump administration’s own commitment to the Asia-Pacific rebalance, symbolized in the US withdrawal from the TPP. From an American perspective, Act East situates Indo-US ties within the context of maintaining a wider Asian balance of power, rather than being relegated to more narrow theaters like South Asia. US leadership in Asia is more likely to endure in a region in which not only China but India, Japan, and Southeast Asian states are vitally engaged in shaping the regional order, since those countries favor retaining some form of US leadership in their region. 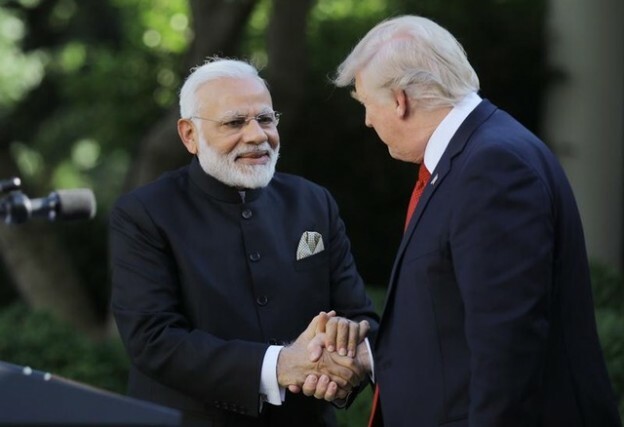 Strategic convergences between the United States and India—on stabilizing Afghanistan, ending Pakistan’s support for terrorism, balancing Chinese power, and sustaining open Indo-Pacific commons within a regional order that is multipolar rather than Sinocentric—suggest more continuity than change in bilateral ties under Trump and Modi. But there are risks posed by US protectionism, at a time when India is leveraging an open global economy to power its own growth. There are further risks to India from pressures within the White House and Congress to tighten restrictions on the flow of highly-skilled foreign workers into the United States, including through the H-1B visa program. US restrictiveness on economic access and high-tech immigration could create serious frictions in bilateral relations. There are also risks on the Indian side, including those posed by the rise of Hindu majoritarianism, which the BJP has pursued as an electoral mobilization strategy, and by India’s continuing failure to truly liberalize its markets to foreign trade and investment. Social divisions within India and a muddling of the reform agenda could make it a less attractive destination for US trade, investment, and technology partnerships that could have a transformative impact on India’s modernization trajectory. But close strategic ties, India’s extraordinary potential, and a common outlook on managing the Asian balance of power are more likely to move bilateral ties to new levels of cooperation between democracies whose popular aspirations and outlooks amount to far more than the sum of their leaders’ ambitions. 1. Author interviews, New Delhi, August 2017. 2. Author interview, senior US official, Washington DC, July 2017. 4. Idrees Ali and Phil Stewart, “U.S. Withholds Pakistan Reimbursement Over Haqqani Network: Pentagon,” Reuters, July 21, 2017, http://www.reuters.com/article/us-usa-pakistan-military-idUSKBN1A61MX . 6. Cited in Gordon Lubold, “Trump Takes New Tack in Afghanistan Fight,” The Wall Street Journal, August 21, 2017, https://www.wsj.com/articles/trump-ups-the-ante-in-afghanistan-fight-1503360382 . 7. C. Raja Mohan, “When Trump Meets Xi,” Indian Express, April 4, 2017, http://indianexpress.com/article/opinion/columns/when-donald-trump-meets-xi-jinping-us-china-relations-4598235/ . 8. Foreign Affairs Committee Chairman Shashi Tharoor speaking at the German Marshall Fund-Observer Research Institute India Trilateral Forum, New Delhi, April 2017. 9. “Official Spokesperson’s Response to a Query on Participation of India in OBOR/BRI Forum,” Ministry of External Affairs, New Delhi, May 13, 2017, http://mea.gov.in/media-briefings.htm?dtl/28463/Official_Spokespersons_response_to_a_query_on_participation_of_India_in_OBORBRI_Forum . 10. See for instance Tom Philips, “EU Backs Away from Trade Statement in Blow to China’s ‘Modern Silk Road’ Plan,” The Guardian, May 15, 2017, https://www.theguardian.com/world/2017/may/15/eu-china-summit-bejing-xi-jinping-belt-and-road ; Naoya Yoshino, “Abe’s Belt and Road Pivot Signals Push to Improve Bilateral Ties,” Nikkei Asian Review, June 6, 2017, https://asia.nikkei.com/Spotlight/The-Future-of-Asia-2017/Abe-s-Belt-and-Road-pivot-signals-push-to-improve-bilateral-ties . 12. Author interview, New Delhi, August 2017. 13. Author interviews, New Delhi, August 2017. 14. Author interview, New Delhi, July 2016.